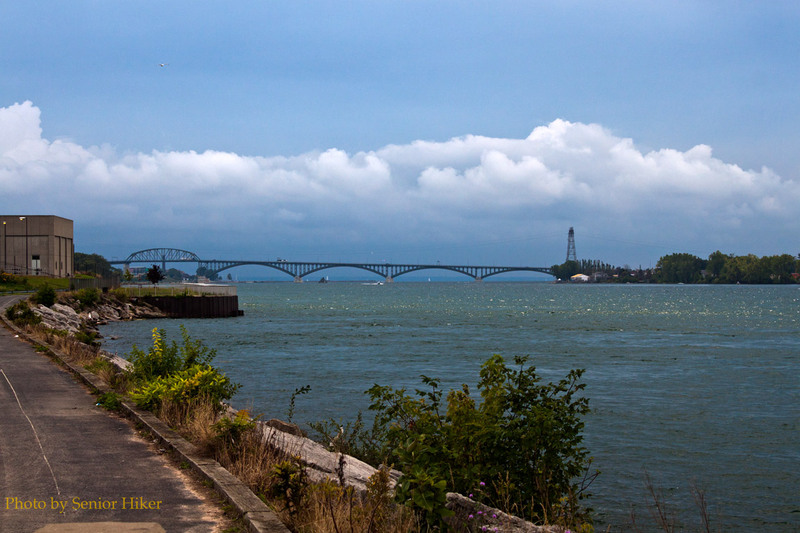 The Niagara River and Peace Bridge, Squaw Island, New York. September 11, 2011. My daughter and her husband live near Buffalo, New York, and they showed us around when we visited them earlier this month. We didn’t make it to Niagara Falls, but we did get to the Niagara River. One of the places we visited was Squaw Island, on the northern outskirts of Buffalo. I captured these pictures of the colds above the river from Squaw Island. The picture above was taken looking south from the island. The bridge is the Peace Bridge connecting Buffalo with Canada. A railroad trestle between the U. S. and Canada, Squaw Island, New York. September 11, 2011. 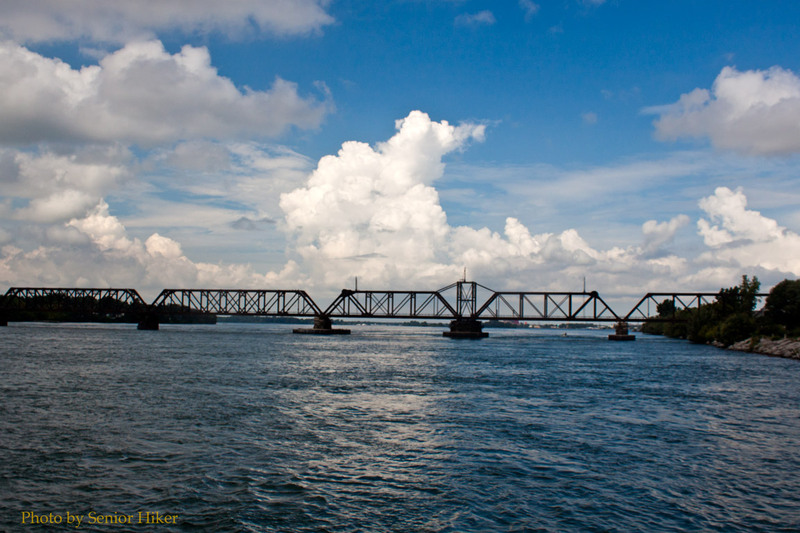 This second picture was taken looking north toward a railroad trestle running between the two countries. I like the way the big white cloud is looming over the bridge. 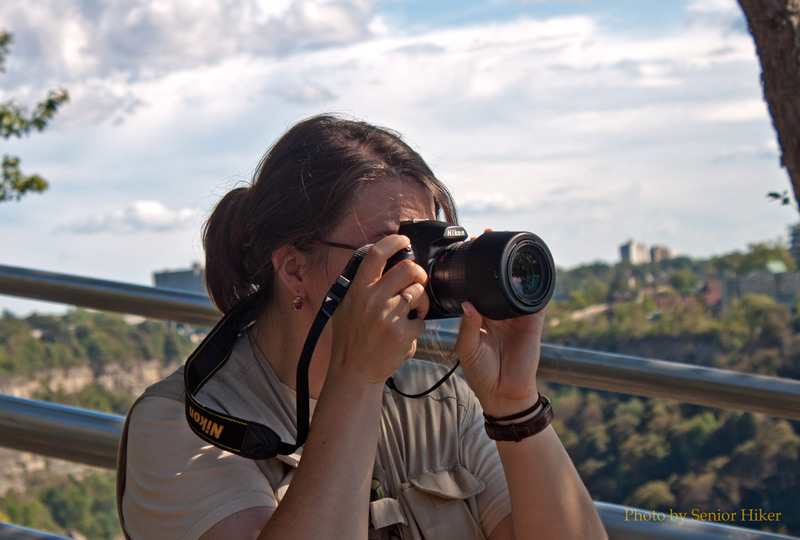 Kelly capturing the scenery at Whirlpool State Park, New York. September 10, 2011. Betsy and I went to Buffalo earlier this month to visit my daughter, Kelly, and her husband, Chuck. Although they both have full-time jobs, Kelly is trying to get established as a photographer. I’m not prejudiced, of course, but I think she’s pretty good — even if she does use a Nikon. She’s shot several concerts, and was sent to San Diego in August by a record label to shoot a concert out there. Kelly has already had a couple of shows, and she will have a show in Nashville in November, at the time of the CMA (Country Music Association) awards. Chuck is a supportive husband in these endeavors, and serves as her manager. They also make a pretty good-looking couple. (Again I’m not the least bit prejudiced). 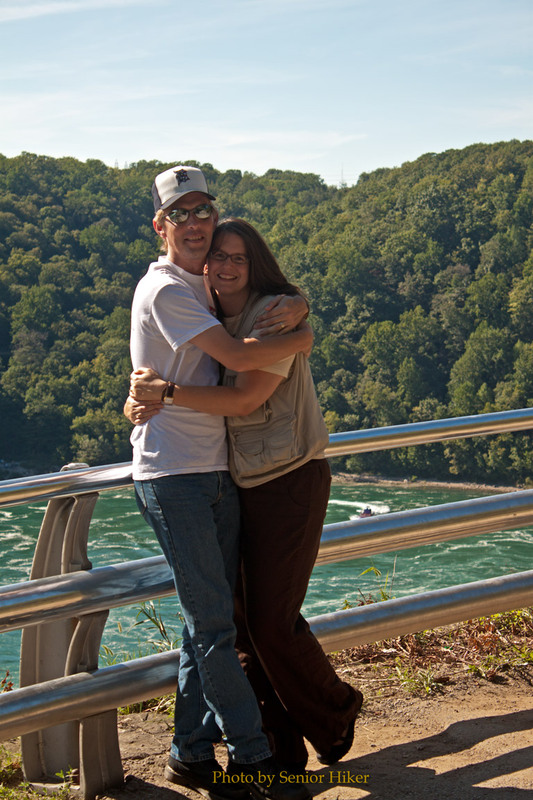 Kelly and Chuck, Whirlpool State Park, New York. September 10, 2011. The Virgin River near the beginning of Riverside Walk. June 18, 2011. 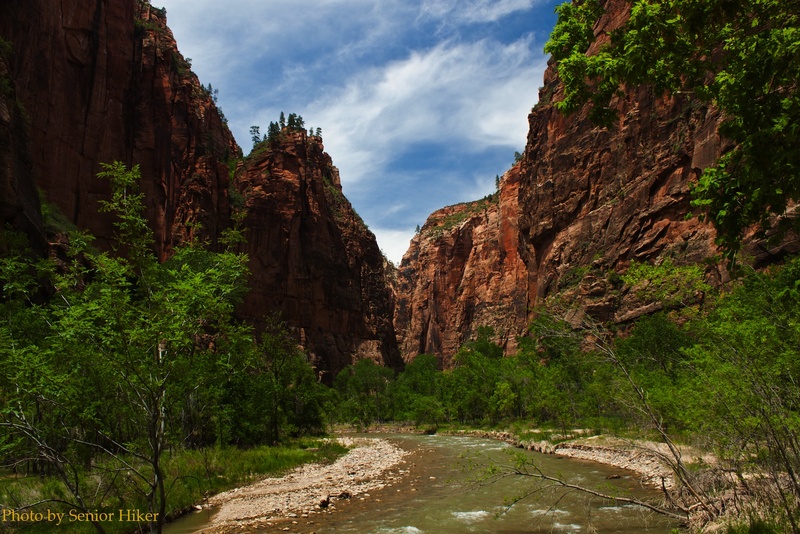 During the summer visitors to Zion National Park have to take a shuttle to visit the places along Zion Canyon Scenic Drive. The last shuttle stop, Temple of Sinawava, is also the trailhead for Riverside Walk. 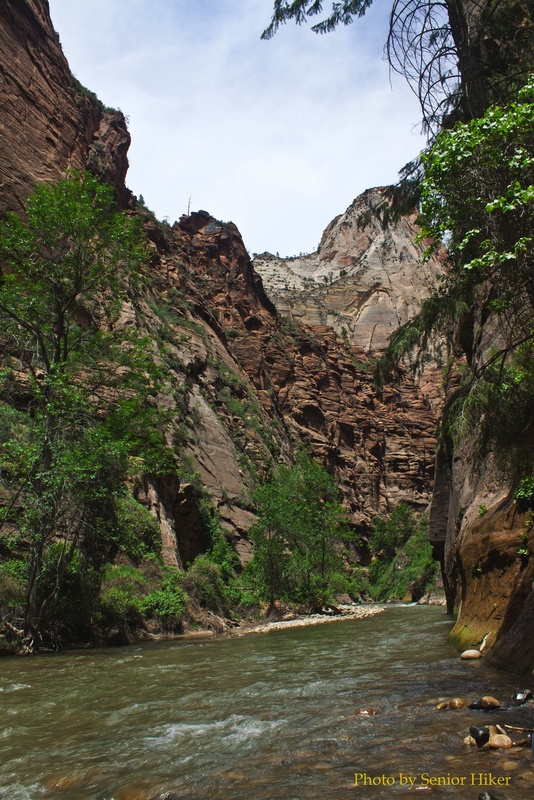 Riverside Walk follows the Virgin River along a canyon which gets more and more narrow as we hike up stream. The river became much narrower and dropped over rocks and ledges as we hiked up stream. June 18, 2011. As we move up the canyon, we start seeing more cascades and drops along the narrowing canyon. It’s hard to remember that this pretty little stream actually carved the canyon we were walking through. 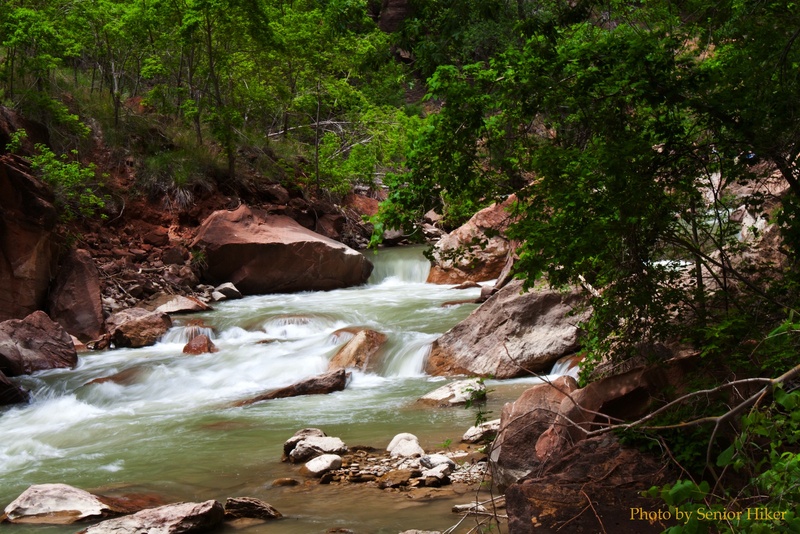 The Virgin River near The Narrows. High water prevented us from going any further up the canyon. Zion National Park, Utah. June 18, 2011. The trail was closed because of high water before we got to the narrowest part of the canyon, but we still got to enjoy the beauty all around us. 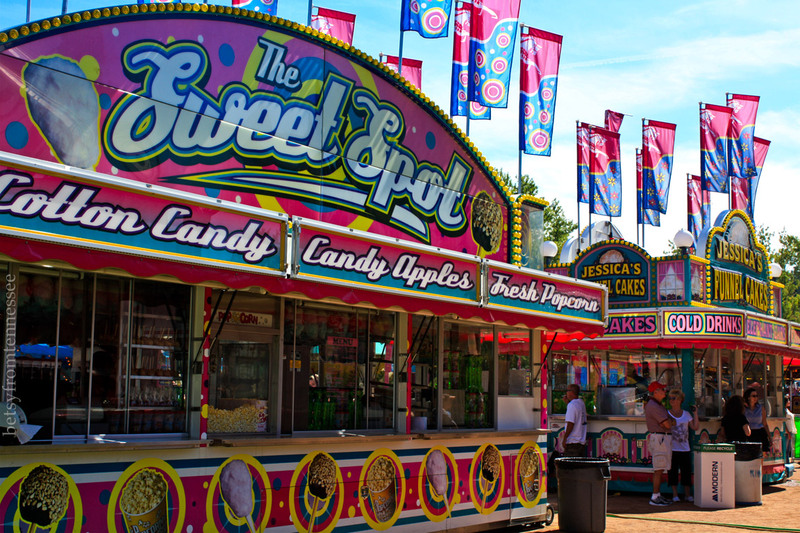 The Sweet Spot, Peach Festival, Lewiston, New York. September 10, 2011. (Photo by Betsy). When we visited my daughter and her husband a couple of weeks ago, they took us to the Peach Festival in Lewiston, New York. The Peach Festival was interesting, and is fairly typical of small-town American festivals. 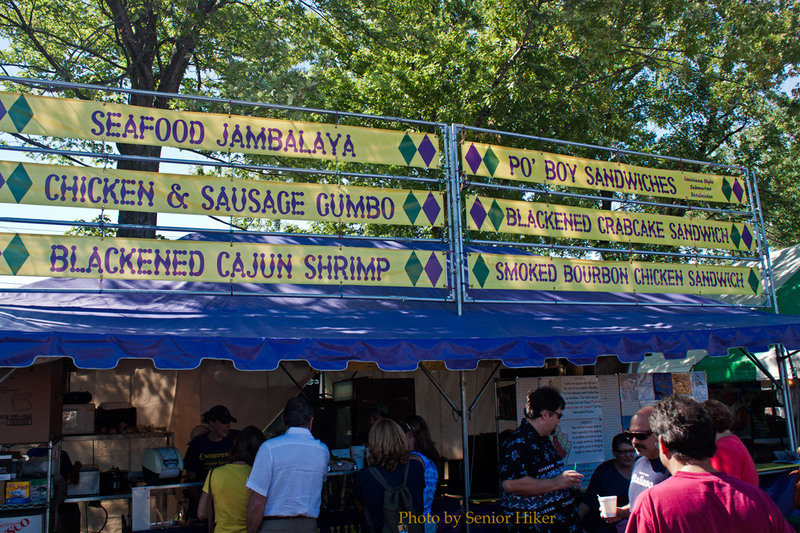 One thing Americans like to do is eat, and the Peach Festival had a wide variety of different foods for just about every conceivable taste. The Sweet Spot (above) had things for those with a sweet tooth. This booth would have been as much at home in Louisiana as it was in New York. Peach Festival, Lewiston, New York. September 10, 2011. Some places offered a wide variety of different foods. I didn't see anyone ordering the Garlic Meatloaf Sandwich. Peach Festival, Lewiston, New York. September 10, 2011. 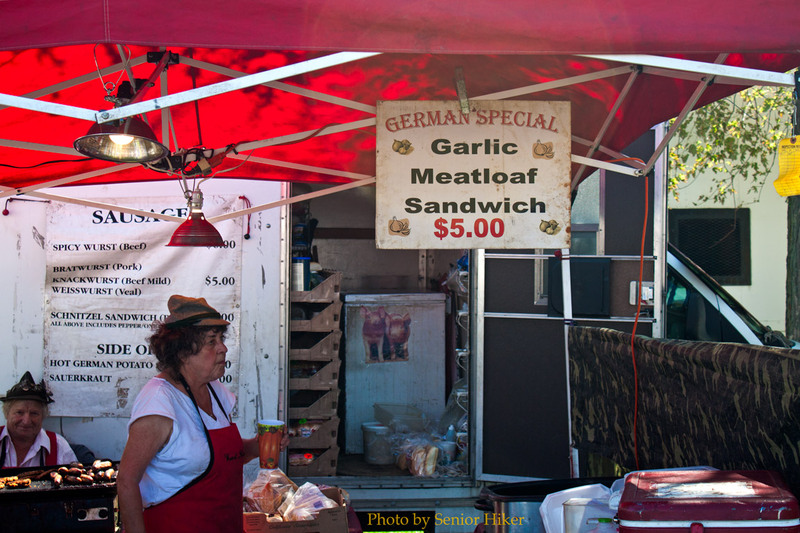 I’m not sure I want to try that Garlic Meatloaf Sandwich! Barbecued turkey legs and corn on the cob. Peach Festival, Lewiston, New York. September 10, 2011. 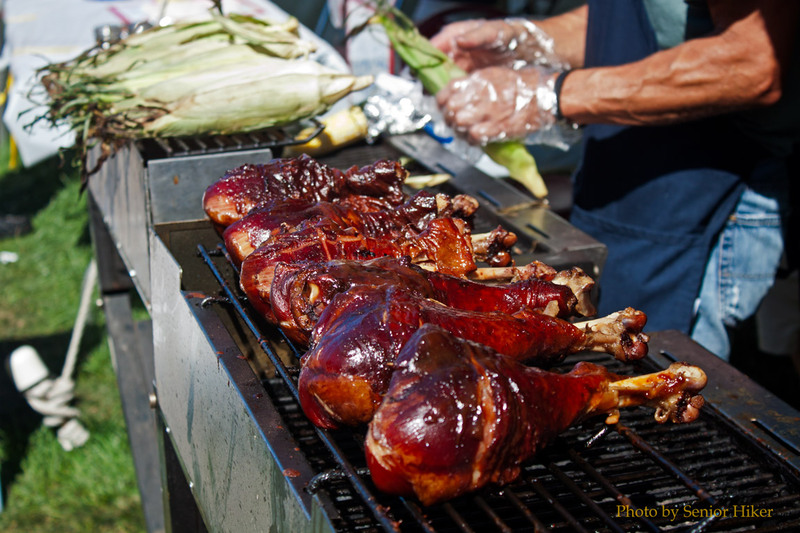 Barbecued turkey legs and grilled corn on the cob are uniquely American treats. Preparing Italian sausages. September 10, 2011. 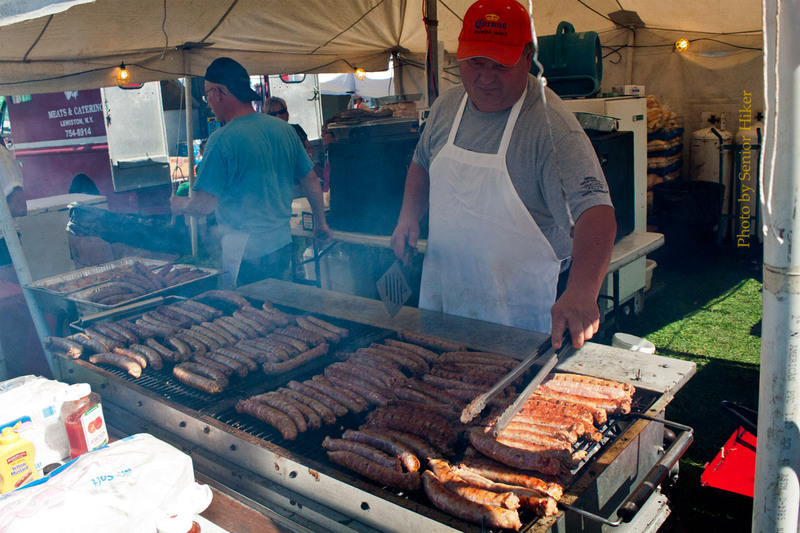 The booth selling Italian sausages was busy preparing for a lot of customers. The aroma started to make me hungry. Peppers and onions. Peach Festival, Lewiston, New York. September 10, 2011. 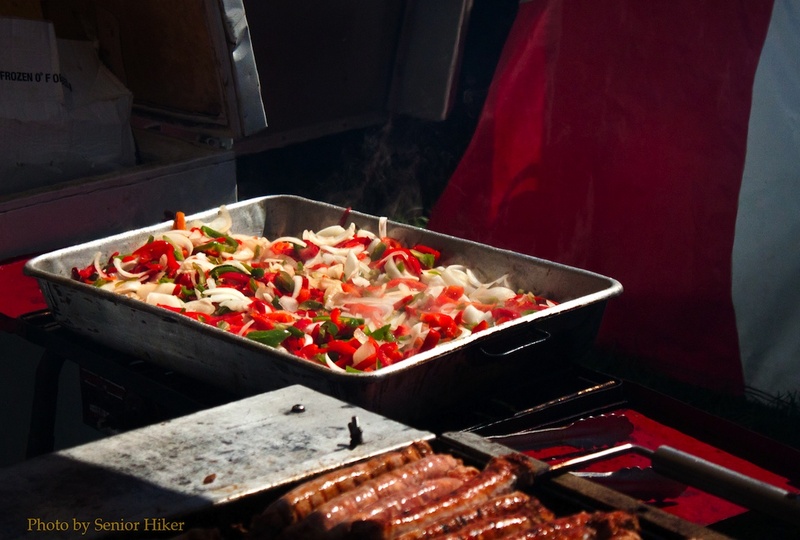 Stir-fried onions and peppers were available as garnishes for the sausages. Did you note anything strange about this visit to the Peach Festival? There are no pictures of peaches. I saw only one booth with peaches, and I didn’t get a picture! Highlights of our most recent trip. September, 2011. Betsy and I hit the road again earlier this month. Since we headed west in June, we decided to head north and east this time. The main purpose of our trip was to visit my daughter and her husband near Buffalo, New York. We had originally planned to go on to Vermont to see some of the covered bridges in that state, but hurricane Irene wiped out three of the bridges we wanted to see, plus several the roads we were going to travel. So we basically decided to play it by ear and see what we could find. 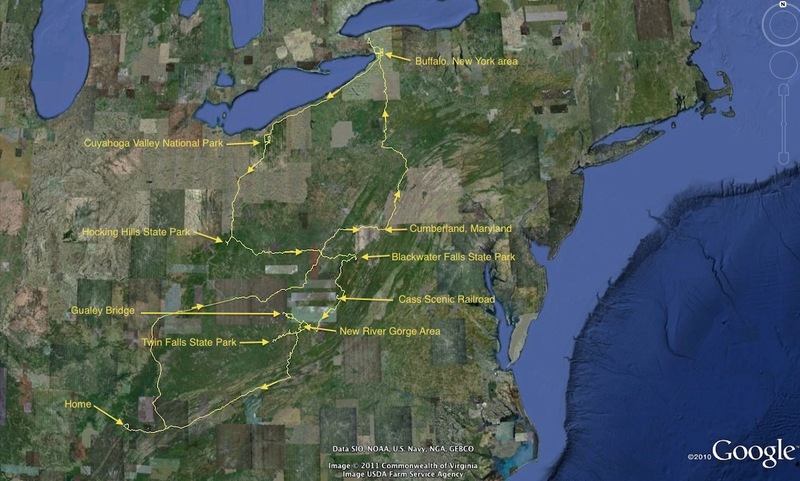 After leaving Buffalo we drove toward Cleveland, Ohio, to visit Cuyahoga Valley National Park. The park, which is relatively new, contains a waterfall we had wanted to see on an earlier trip, but did not. A blog friend of Betsy’s had said that Hocking Hills State Park in Ohio was a wonderful place to hike and visit waterfalls. We decided to stop there for a visit as well. We had both wanted to visit Blackwater Falls in West Virginia, so we drove there, having an adventure on mountain roads to get there. Blackwater State Park is absolutely beautiful, and we will definitely plan on going back so we can spend more time there. 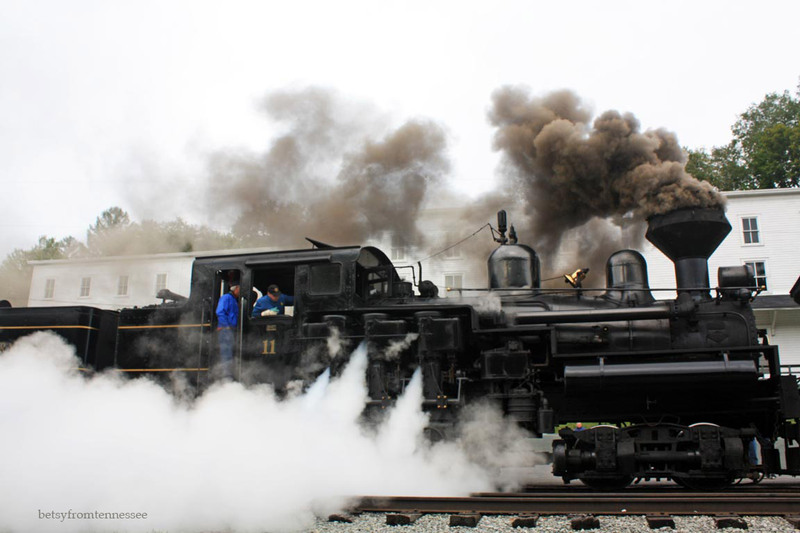 After leaving Blackwater Falls we took a ride at the Cass Scenic Railroad State Park, where we traveled to the top of Balk Knob behind a steam engine. We also wanted to revisit the New River Gorge in West Virginia. We had seen the upper New River last year, but this year we saw the New River Gorge Bridge and drove down to the bottom of gorge and back up. We also visited several other parts of the New River National River before heading back home. It was a wonderful trip, and I now have hundreds more pictures to organize and get ready to share. I was going through some of my archives, and came across pictures from 2008 of the day lies we have in our yard. 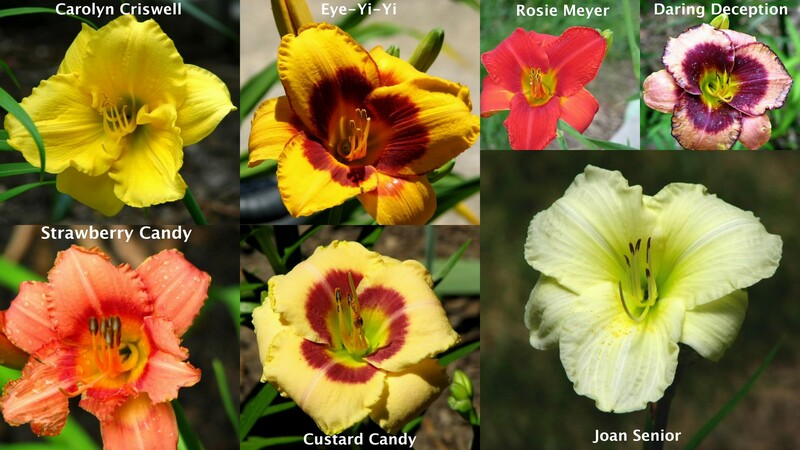 Since we missed many of our day lilies this year because of our western trip, I was glad to come across these pictures. My Blogging Muse has become about as dry and unproductive as our yard and garden, so Betsy and I have decided to take a blogging break. I’m not sure what (if anything) we’ll do other than trying to keep our roses and other plants alive. If my Muse cooperates, I’ll be back the last week of September. Sinawava Falls from the Temple of Sinawava, Zion National Park, Utah. June 18, 2011. 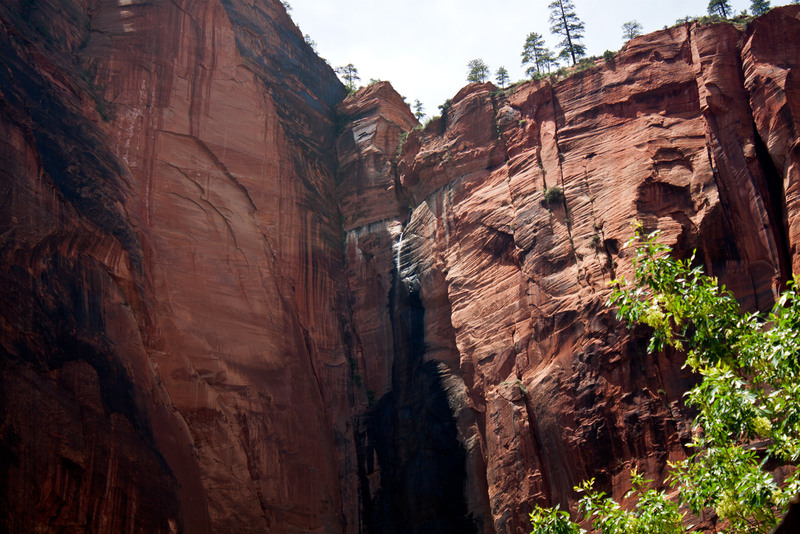 The Temple of Sinawava is the last shuttle stop along the Zion Canyon Scenic Drive. The only way to get to it when we visited the park was by shuttle bus. I could not see much of the scenery while on the bus, so I was happy to get off so I could look around. I was doubly happy when I spotted this waterfall high up on the canyon wall. There was only a thin stream of water coming over the edge, but it could be followed for quite a way down. Sinawava Falls, Zion National Park. June 18, 2011. 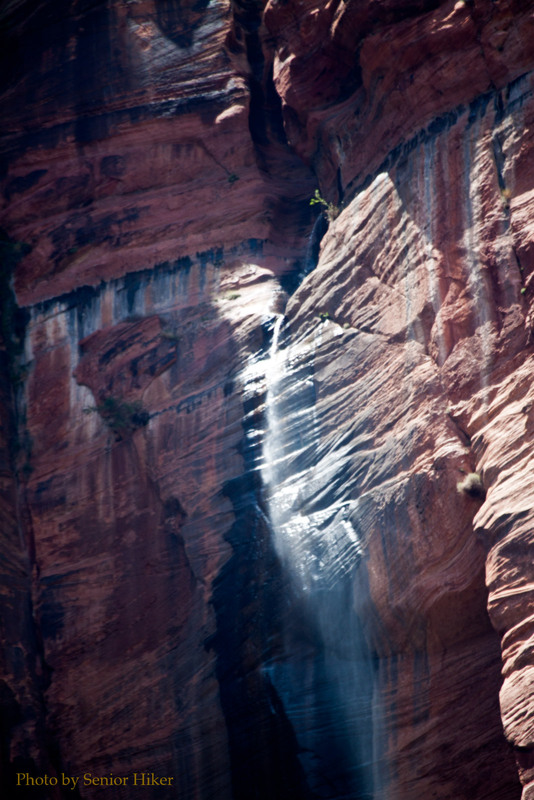 My telephoto lens brought the detail of the waterfall closer, but lost the beautiful canyon around Sinawava Falls. I couldn’t decide which photo I like best, so I’m posting both. Blatant Iris, Fairfield Glade, Tennessee. August 31, 2011. This has been a very strange year on the Cumberland Plateau. We had an unusually wet spring, followed by an extremely hot and dry summer. We had only a trace of rainfall in all of July and August. The lawn and gardens show the stress of such hot, dry weather. 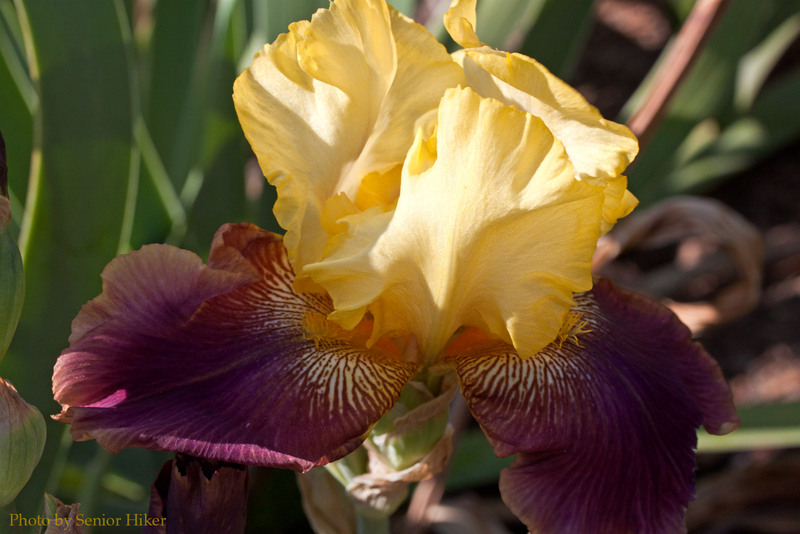 But, in spite of this, we’ve had iris blooming fairly consistently since April. We have several that are supposed to bloom twice a year — once in the spring and once in the fall. But the irises in our front flower bed just keep blooming (that’s not a complaint). Late last week our Blatant Iris sent up another flower stalk. The stalk isn’t as tall as they usually are, but the blossom is still pretty. 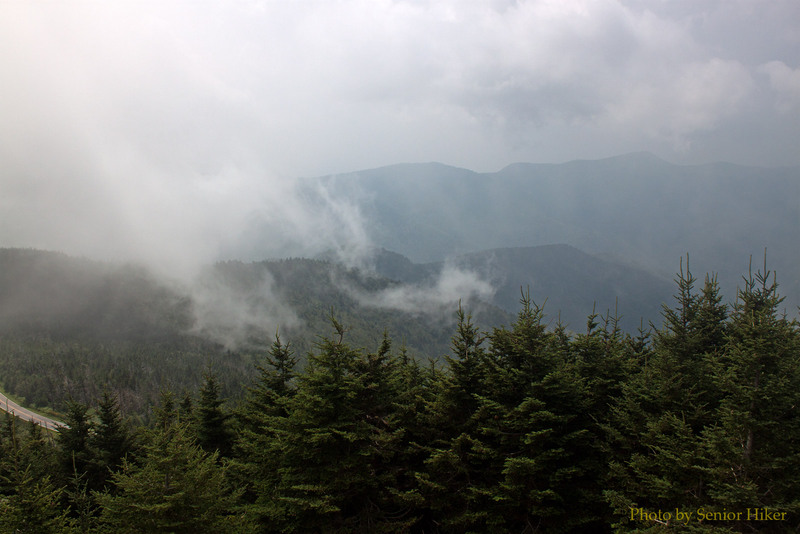 In the clouds atop Mount Mitchell, North Carolina. August 5, 2011. 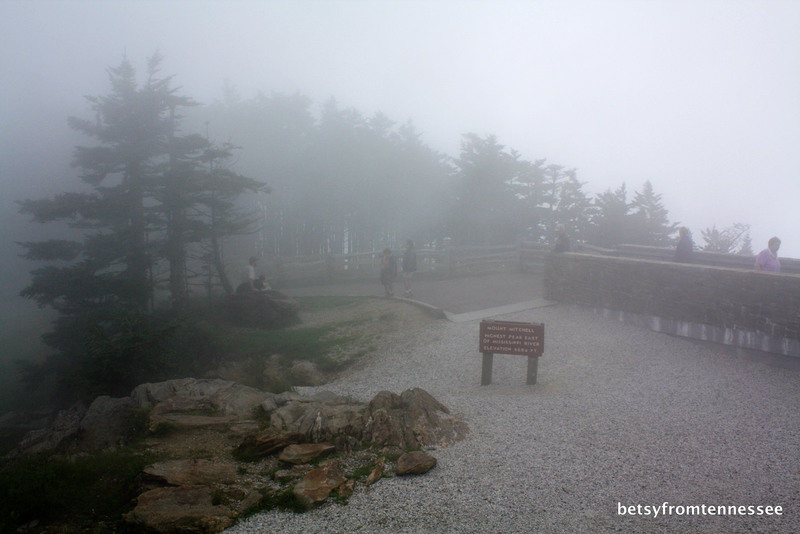 While we were in Asheville, North Carolina, for Betsy’s birthday last month, we drove up to Mount Mitchell, the highest peak east of the Mississippi River. We’ve been there before, and always enjoyed the view. But things were a little different this time. We weren’t above the clouds — we were IN the clouds, as you can see from the picture above, which Betsy took from the observation deck at the summit. We saw mountain ridges through a break in the clouds. Mt. Mitchell, North Carolina. August 5, 2011. As we stood on the observation deck a breeze picked up and we were able to make out some of the nearby mountain ridges. 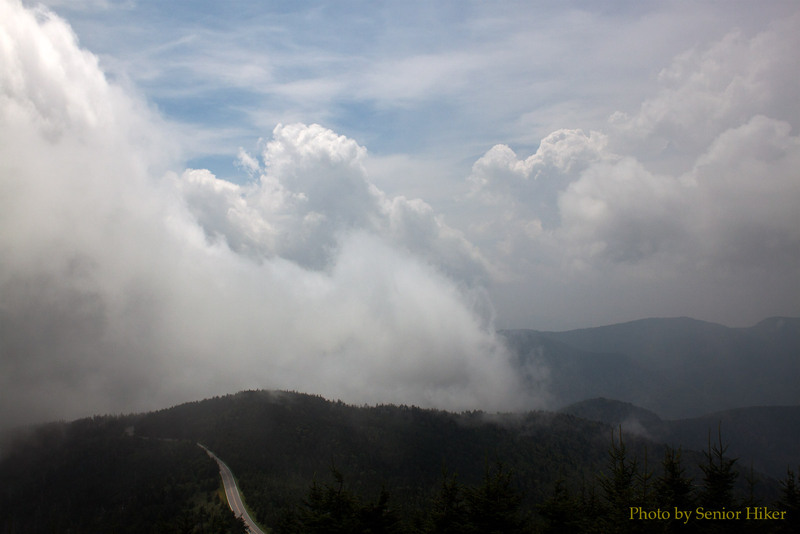 Blue sky and clouds, Mount Mitchell, North Carolina. August 5, 2011. The clouds soon moved back in, but not before we caught a glimpse of some blue sky. Dad, my sister-in-law Bonnie and brother Ken. August 31, 2011. My Dad turned 99 on Monday. He’s still in relatively good health, although he has gone down since my Mother died in June. He suffered a small stroke about three weeks ago, but is much better than when we last saw him a couple of weeks ago. My brother and sister-in-law came down from Indiana this week, so we all got together last night to celebrate Dad’s birthday. 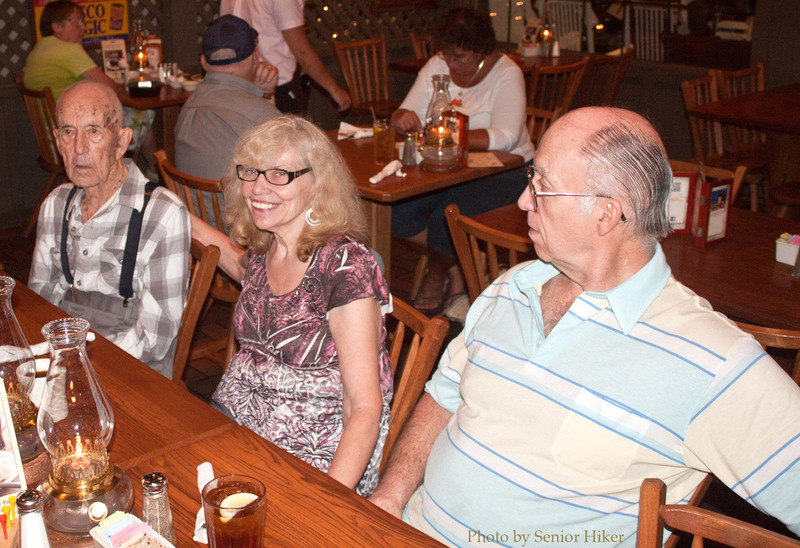 Cracker Barrel is one of Dad’s favorite places so we got together to celebrate. All three of his children (do I qualify as a child when I’m pushing 70?) and our spouses were there. 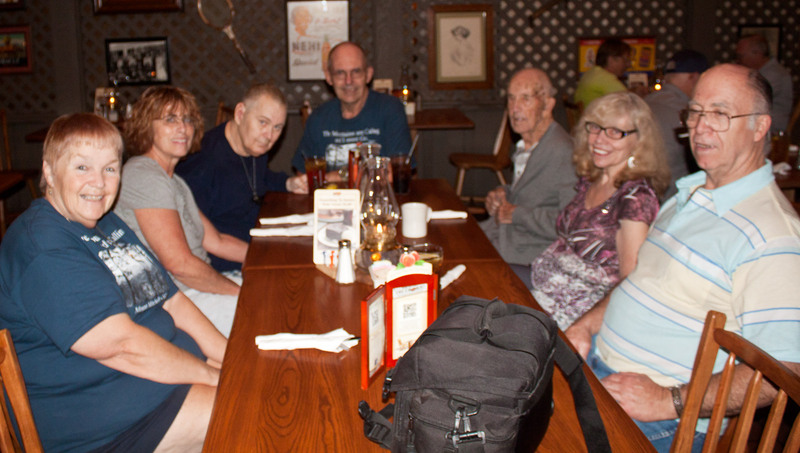 Betsy, my sister Janet, brother-in-law Charlie, George, Dad, sister-in-law Bonnie and brother Ken. August 31, 2011. The Cracker Barrel staff came to the table and sang Happy Birthday to Dad and presented him with some apple cobbler and ice cream. I think that was Dad’s favorite part of the meal.